One thing that freaks out my clients is the fact that some scabbing and "flaking" of the pigment is actually quite normal. Unfortunately it may look like your brows are coming completely off, but don't let it freak you out because some of it is normal. Day 42 (after touch up): "These are better than I could have ever imagined!!!" And now you are back to the way you felt after the first day Trust me when I say that this is a real cycle. That is basically the process in a nut shell! As you can see there are definitely lots of up's and down's that occur, and if you aren't ready for them they can definitely cause some stress. This picture outlines the difference between the initial visit (healed after 7 weeks) and the final product (after the touchup). One of the benefits of the touch up is to fill in any gaps that may get pulled out as a result of scabbing. ​The most important thing you can do is set your expectations up early and TRUST your artist! Is Scabbing normal after the first visit? Scabbing is definitely a normal part of the healing process. I'm a big fan of dry healing (I think it's better than ointment healing and you can read about why here). ​Ointment healing results in a more crisp and defined brow when everything is said and done, but there is the issue of scabbing. When using the ointment healing process some of the scabs are "covered" and are less likely to be "picked" off of your face. The dry healing results in more scabbing (which is ok), but can be more tempting for people that have a tendency to "pick" them off. Scabbing usually starts around day 5 (after your initial visit) and persists through day 10. As the scabs naturally fall off it may look like your brow becomes "patchy". This is OKAY. Don't let it freak you out. Don't worry if it looks patchy, it will only be temporary. 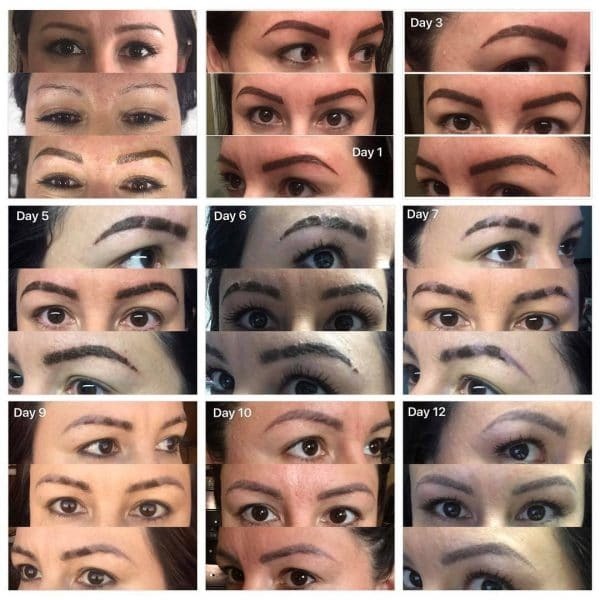 ​The microblading pigment is placed in a shallow well in your brows. The scabbing and healing process can adhere to the pigment and if you pick it off you are literally pulling the pigment off of your face in the process. This can basically undo all of the initial work and may result in a longer visit. If you let the skin heal naturally it will "let go" of the pigment through the process. Do the brows actually stay on long term? The answer is yes, they do! This picture shows you the difference between fresh microbladed brows and what brows look like 6 months later. The average length that brows last ranges from 9 to 15 months. As long as you do these two things you will ensure that your brows will last. Some other factors that are out of your control may limit the longevity of your brows, but these aren't under your control. Things like: how much oil your skin produces, your hormones and your genetics. ​The physical part of healing is only part of the journey. 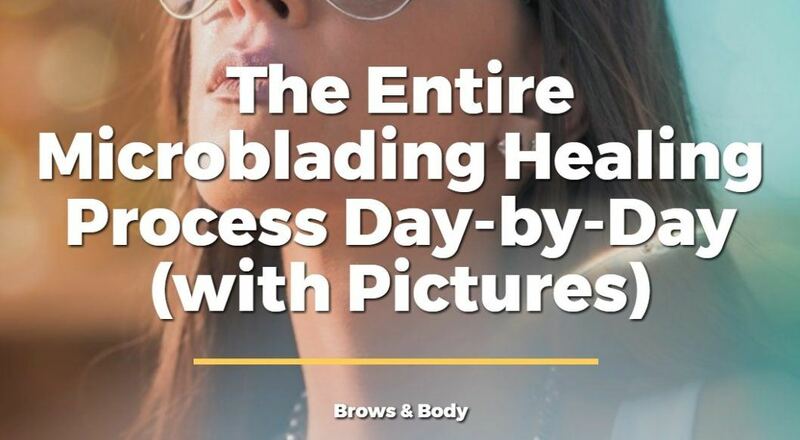 Because your brows are such a huge part of your self confidence (in some women) there is also an emotional component that many women go through as they heal. Your brows will get much darker and thicker from the time you leave until around day 5. Be prepared for your brows to look harsh and possibly unnatural during this time period. If you have a spouse or significant other tell them before hand to keep comments to themselves because even though you’ll know they will heal better it can still be hard since the brows are on YOUR face. You’ve seen my healed pictures so be patient and know they will look perfect with time! After the darkness wears off you’ll start scabbing and flaking, and underneath your skin it’s going to look like there is no pigment left. Don’t worry: it’s still there and it comes back in with time. Your skin’s healing process is just that… a process. You did not go through that entire process for it to all be gone at day 7. As long as you are following aftercare instructions to the T you have nothing to worry about. Around week 3 and 4 when your skin is closer to being complete healed you will notice there are some patches and strokes that didn’t retain as they should have. Just realize that it’s impossible to get your brows perfect on the first visit. Any missing pieces or strokes we want to fill in will be done at the touch up so please make sure you make this appointment a priority as well. 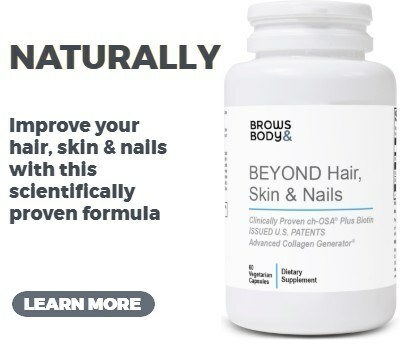 Without it your brows won’t ever be completely “done”. At this point (even around week 2 when you are completely scab free) you can put eyebrow makeup on to help even out any missing strokes. Following these basic Do's and Dont's will help you achieve the best results possible. 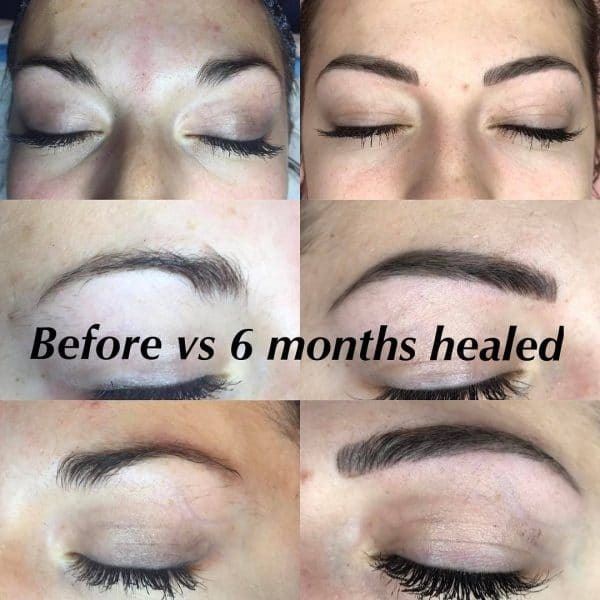 Remember that during this healing process your worst enemy is anything that can get into your brows and up root the pigment. That means things like sweat, lotions, creams, etc. Stay away from these as your brows heal. Another important factor, which is somewhat out of your control, is infection. Infection can cause issues with pigment retention but shouldn't be a big problem if you follow the aftercare instructions. 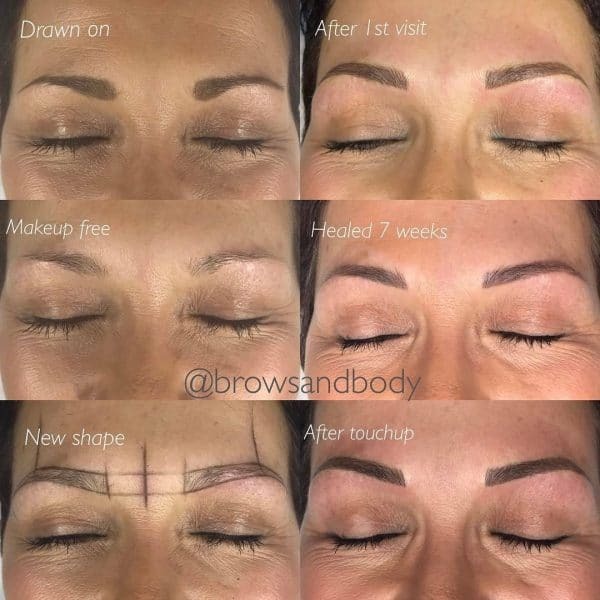 ​Remember that the microblading healing process takes time and requires a fair amount of patience and trust on your part! But trust me when I say that it will all be worth it. Did you have any issues with the healing process? Did your scabbing or flaking freak you out?